Martian sand dunes near the central pit of a 35-kilometer-wide impact crater. This image was acquired by the High Resolution Imaging Science Experiment (HiRISE) instrument aboard MRO on April 27, 2009, at 15:16 local Mars time. Image: NASA/JPL/University of Arizona. Would you wave goodbye to Earth and live out the rest of your days on Mars? At first glance, our neighbouring planet doesn't seem particularly homely: Mars has an average temperature of -62°C and an atmosphere so thin that if you stood on it unprotected, your saliva would boil away to nothing. There's no liquid water at the surface of Mars, and so far experts have found no signs of life. It's clear that if humans ever wanted to walk on Mars in large numbers, there would be some work to do to make it liveable. Yet some people, including business magnate and engineer Elon Musk, still hold out hope that one day a colony of humans could live on the planet, and some have contemplated the possibility of terraforming. Terraforming means changing a planet or moon's atmosphere or surface to make it more habitable for organisms that live on Earth. Terraforming could theoretically result in a temperate, correctly pressurised environment for a colony of thousands of humans and other organisms from Earth to live safely. But Bruce Jakosky at the University of Colorado and Christopher Edwards at Northern Arizona University have done the maths, and concluded that the idea is beyond the realms of possibility - or at least not using the technology we have currently available to us. A new paper, published in Nature Astronomy, declared that there is not enough carbon dioxide on Mars to make it a viable prospect for terraforming. Zach Dickeson, a PhD Researcher at the Museum, is investigating ancient sources of liquid water on Mars. Commenting on the study, he says, 'It's a fascinating paper. I think a lot of people know about the idea of terraforming from science fiction, and perhaps held out hope that it might be possible on Mars. Why would we want to live on Mars? It's a backup plan for the human race should a planet-wide disaster happen on Earth. Potentially deadly threats include nuclear destruction, asteroid impacts and pandemic. Colonising other planets could ensure the continuation of humanity, should the worst happen. The southern pole of Mars has been hiding a pool of liquid water. © NASA/JPL/Malin Space Science Systems. The first step towards making Mars habitable would be raising the temperature and atmospheric pressure enough for Earth's organisms to survive. 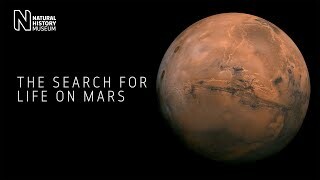 Mars's atmosphere (the envelope of gases that surround a planet) is very thin. Pressure on the planet is so low that liquid water cannot exist at the surface, although it has been found beneath the planet's ice caps. Water is either ice in cold temperatures, or steam in warm ones. Zach explains, 'If a human were dropped onto the surface of Mars right now, their saliva would boil away from their mouth. They also would not have enough oxygen to breathe. If we wanted to live there, we would have to wear a pressurised suit. Carbon dioxide and other greenhouse gases would be vital to keep Mars warm enough. Greenhouse gases trap heat in the atmosphere. Although there is too much of this warming effect happening on Earth, a little bit of a greenhouse effect is nonetheless necessary. Earth's blanket of gases protects us from the radiation of the Sun and keeps our climate within a liveable range. Some have suggested that there is enough carbon dioxide locked away in Mars's ice and rocks to heat the planet and thicken the atmosphere, if only we could release it. The short answer is no. Using data from rovers and spacecrafts that have been monitoring Mars, the team in the study identified all of the planet's possible reservoirs of carbon dioxide and their potential contributions to the atmosphere. The researchers also took into account the continuous leaking of atmospheric CO2 into space. The study concludes that at best, the readily accessible carbon dioxide could only triple Mars's atmospheric pressure, which is only one fiftieth of the change needed to make Mars habitable. It would increase the surface temperature by less than 10°C. Mars also can't support a thick enough atmosphere for humans because it doesn't have the same magnetic field as Earth does. Earth's molten core creates a magnetic field surrounding our planet that helps to protect the atmosphere from the Sun. Harmful rays from the Sun are deflected by the magnetic field, so they don't hit the atmosphere and damage it. It's thought that Mars once also had a molten core and a magnetic field, but lost it billions of years ago. Now Mars is unprotected from the solar wind, a stream of particles from the Sun into space. This means that gas in Mars's thin atmosphere is constantly leaking into space. Recent missions to Mars have shown that the majority of the planet's ancient, potentially habitable atmosphere has been lost to space, stripped away by solar wind and radiation.